A vegan diet can be great for weight loss, but what if you want to gain muscle and lose fat? I made some small changes to my eating habits to accommodate a more athletic lifestyle, due to my rekindled passion for dancing and general fitness. Following a few general tips, I created a simple meal plan that explains how I eat most days. I usually follow this guide 6-7 days a week, with 2-3 "cheat" meals where I eat whatever I want (which usually coincides with a restaurant visit on the weekend). I usually work out shortly after I drink this. Starting my day with protein helps me feel more full throughout the day. "30 in 30" vegan smoothie (more information in my review here). Recipe: Mix 21 g each Olympian Labs Chocolate Pea Protein and Sun Warrior Chocolate Classic Protein with 1/2 cup cold water, 1 cup almond milk, and 1/4 frozen banana. I make four at a time in my blender and store in the refrigerator. 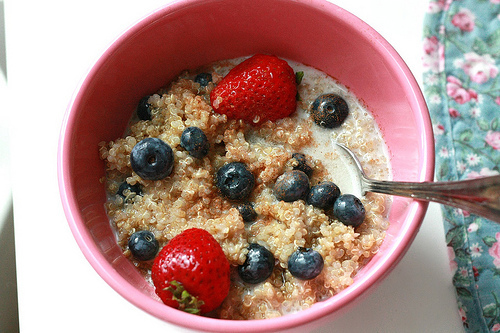 Replace oatmeal with quinoa for a high-protein breakfast. I usually eat this right after a workout, so I want a nice blend of carbohydrates and protein. Eating carbohydrates alone, such as a sugary cereal and almond milk, leaves me hungry 1-2 hours later. I also eat the following supplements with this meal: B12 and Calcium. For more on vitamins and supplements, see my article on vegan vitamins. This is the meal where I try to cut back on the carbs and get in some fresh veggies. It is much easier for me to do this at lunch, since I'm more disciplined in the middle of the day than when I'm tired (at dinner). Veggie burger salad - This is one of my "staple" foods that I eat 3-4 times per week. 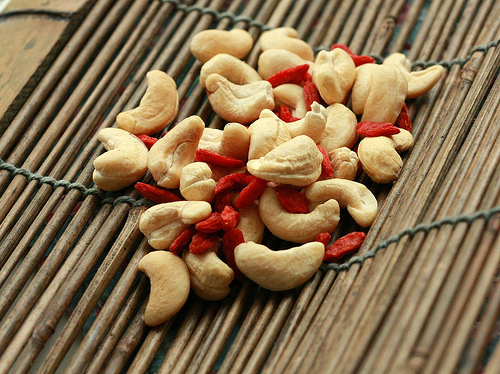 Combine nuts with bulk dried fruit to make your own trail mix. I like to combine a fruit or vegetable with some sort of protein, such as nuts or hummus. I try to limit my nut intake to 1-2 servings per day total, to keep the calories down. If I work out in the afternoon, I prefer a beauty smoothie as a recovery drink. I tend to eat this meal with my man, and he isn't a huge fan of "meal" salads and other lower-carb vegan meals. I tend to eat more carbohydrates at this meal and cut back at lunch instead. Some theories say you shouldn't eat carbohydrates after lunch, but eating carbohydrates at dinner hasn't had a noticeable negative effect on my progress. When I want to cut back, I try to skip traditional desserts most days and indulge in sugary treats 1-2 times per week. I do have a sweet tooth and look for ways to satisfy my cravings without going overboard. Don't forget to buy organic if you can afford it! It's better for the planet and your body. Note: This is the second in a three-part series. The first part can be found here and includes general tips. For ways to eat healthy at restaurants and on the go, read the third part here.